Your challenge this week: to make a very simple birdfeeder using just pinecones, lard and birdseed, and then watch your garden birds go crazy for the extra food over the winter. It’s a child-friendly project which I know you, your children, and the birds will find hugely rewarding. Kindness, Responsibility, Gratitude, Generosity, Resourcefulness, Compassion, Optimism, Patience, Commitment, Serenity. For the pine cone bird feeder, you will need pine cones, peanut butter or lard, bird seed and string. You also need some little people to help you. However, this is by no means a prerequisite. I can vouch for this being a lovely therapeutic activity to do on your own with a cup of tea and Radio 4 on in the background. Either follow the instructions (found at the bottom of this page) for the pine cone bird feeder or find other ideas online. This particular idea is great for making at home with young children but there are hundreds of ideas out there that may hold greater appeal to older and more creative children. Buy a bird feeder and sit by your window (with your cup of tea and Radio 4 on in the background) and watch the birds feasting on your offerings. Just by putting out a little food over the colder months you can make a real contribution towards the well being of local birdlife and help to sustain, if not improve, the bird populations in your local area. Like many people, my children and I enjoy wildlife spotting when we’re out and about but this activity gives us the opportunity to watch the birds from the comfort of the kitchen window. It really cheers up my morning to see the birds having their breakfast whilst the children are eating theirs. In my hectic life, it can be a very peaceful and precious few minutes to be able to just stand and watch them flying around the feeders and picking at the seeds. I urge you to try this, it really is very simple and very rewarding. It is generally late autumn to early spring when the birds really need our support so this is the perfect time to start collecting pinecones and picking up some birdseed when you do the weekly shop. We’ll be using lard and a generic bird seed but rotating and alternating food will assist in appealing to a greater variety of birds. Fat balls, peanuts, mealworms, berry cakes as well as bird seed are all available in pet shops and some supermarkets and not particularly expensive to buy. A little leftover grated cheese will appeal to smaller birds like wrens if you are lucky enough to have a little patch of grass under a tree. Robins and dunnocks also prefer to feed close to the ground but make sure to only offer this if you are sure they won’t be picked off by your or your neighbour’s hunting furbabies. Thrushes and blackbirds will favour the fruit and goldfinches will favour the seeds, especially the high-quality seed mixes available which contain niger seed. The RSPB have a lovely little seed cake recipe which we’ve also tried, it’s a messy one though so be prepared if you want to give it a go! On a personal note, I have always worried about putting food out for the birds who live around my home. Why? Because I have a cat! But as it turns out he’s a rubbish hunter, very lazy and much prefers his food bowl so the birds are pretty safe. If you have similar concerns the RSPB has some advice to put your mind at rest and help support your efforts for the local feathered wildlife. In my humble opinion teaching our children to be compassionate towards insects, animals, fish, birds and any other wild or domesticated animal is very important. What we need to be demonstrating is respect and kindness to all living things and that demonstration starts at home with our pets and our immediate wildlife. This quote above may be 80 years old but it makes sense to me and I like it. The 52 family challenges idea was born out of a desire to embed values in my children’s lives that will carry them through their childhood and into their adult years. I want them to find their own paths, to become strong but compassionate and moral inhabitants of this planet and I especially love this simple challenge for the very reason that it takes on an empathic angle. Empathy is something that many, (my late Father included), consider a rare if not impossible character trait for children to hold because of their limited social experience. Now I don’t profess to know either way but like many of Dad’s philosophical based opinions, I didn’t always agree with him and so I still try to encourage my children to consider how it might feel “to be in someone (or something) else’s shoes”. So, sitting together with your children on a chilly morning, watching the birds with their feathers puffed out against the cold and eating from the birdfeeders lends a quiet moment for them to reflect. To reflect on what it must be like for those birds outside in the winter when food is scarce and to reflect on the impact their tasty birdfeeder is having. 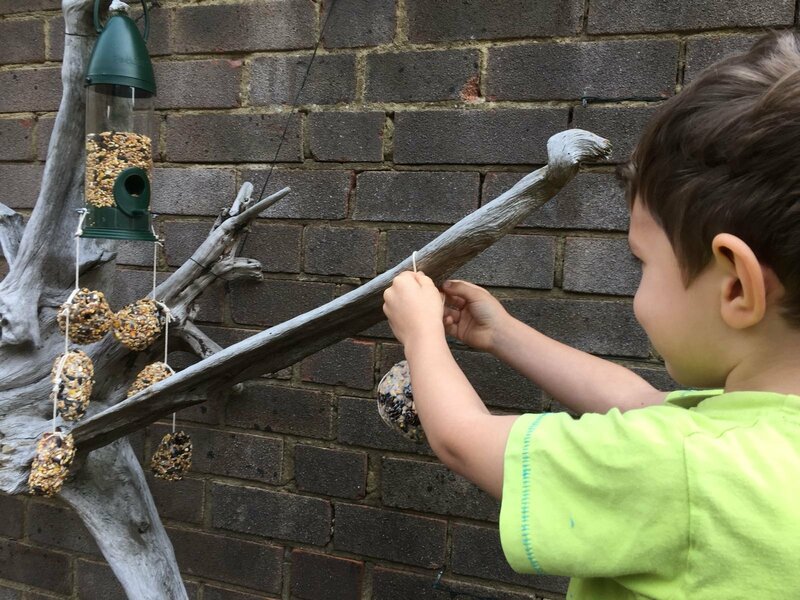 I’m hooked on this simple challenge, it’s the second year I’ve done this and I would like to think that the children will begin to feel a sense of responsibility to make sure that when it’s really cold outside we always have something out for the birds to eat. Make your birdfeeder and feel all warm inside watching your feathered friends relishing their tasty treats and knowing they won’t go hungry this winter. How to make your pinecone birdfeeder. Go to the woods and enjoy a walk, remembering as always to absorb the season, the sights, sounds and smells of the woods as they start their beautiful decay back to a blank canvas ready for next year. Oh and find some pinecones! Back home put the kettle on and make a cup of tea. Get out your pinecones and string and cut it into lengths long enough to tie around the top of the cone into a loop to hang from tree branches. Failing that you can always poke your finished pine cone into dense bushes for the birds and maybe some little mammals to find. Have a sip of your tea before it gets cold. Put some spreadable temperature lard (or peanut butter – salt and sugar-free variety please) into one bowl and the bird seed mix into another. Finish your tea and gather your child/children/or sit in peace and enjoy the therapeutic nature of the next bit. Using your fingers, because we all enjoy a bit of sensory play, poke, spread and fill all the gaps and holes of the cone with lard or peanut butter. Roll your sticky cone in the bowl of seeds until its well covered. Hang in a tree out of reach of any cats or other bird predators but in view of your windows if possible. Make more tea and maybe a biscuit and enjoy the fruits of your labour. I will be trying this on Sunday!